Melt the butter in a frying pan over medium-high heat, until it sizzles. Add the shallots and the mushrooms, cook and stir until the mushrooms are tender, then add the garlic and cook it a few more minutes, until the garlic is cooked, but not so cooked that it gets that awful bitter taste! Stir in the creme fraiche, dijon, and worchestershire, and cook it until it’s warm and well blended, then season it with a bit of salt and a couple of turns of freshly ground pepper. P.S. 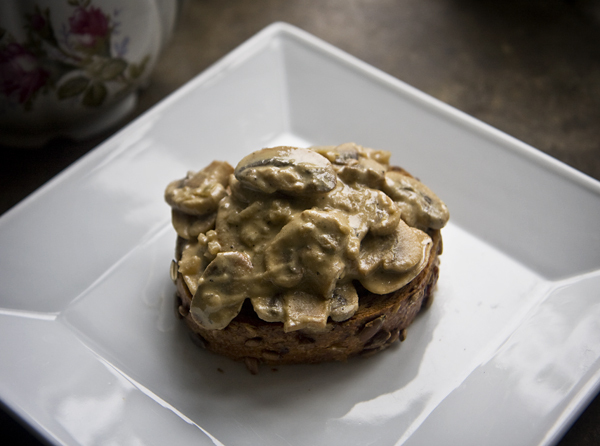 For me, this recipe makes enough mushrooms for 2 toasts piled high, or 3 more modest toasts. Danish bread is smaller than the American bread I remember, but I’ve heard packages are shrinking over there, so who knows? Just be prepared that if you’re more than one, you’ll probably want to multiply the recipe! Looks delicious Sage. I hope you and Opie have a wonderful weekend! That looks so good and right up my alley for a comforting meal.